Not so handsome as the last, but a very conspicuous plant, on account of its size and the pale tint of its foliage, though the flowers are too dull in color to be striking. It is shrubby and has a number of stems, which form a loose clump from three to six feet high, with rather leathery, resinous leaves, all but the upper ones with scalloped edges, and the whole plant is covered with fine white down, so that the general effect is pale gray, blending with the white or pale lilac flowers and purplish buds. 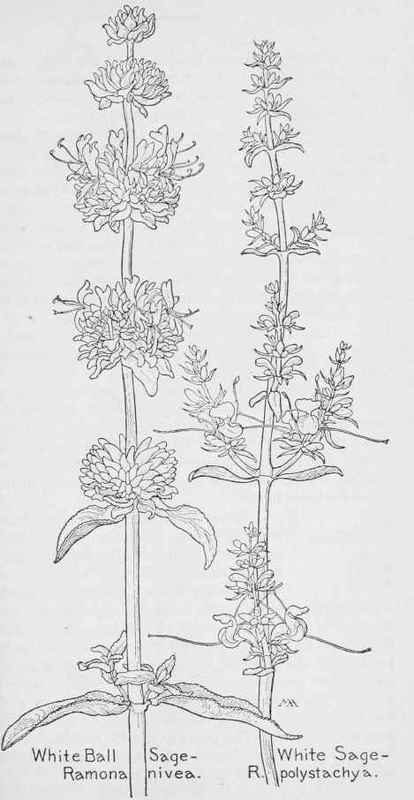 The flowers are about half an inch long and are very queer in form, for the only conspicuous part is the lower lip, which is very broad with a ruffled edge and is turned straight up and backward, so as to conceal almost all the rest of the flower. The long jointed stamens, which are borne on the lower lip, stand out awkwardly like horns and from one side of the flower's face a long white pistil sticks out, with something the effect of a very long cigar hanging out of the corner of its mouth! All these eccentric arrangements are apparently for the purpose of securing cross-pollination from the bees, which frequent these flowers by the thousand, as this is a famous bee-plant and the white honey made from it is peculiarly delicious. It grows abundantly in valleys and on hillsides, from Santa Barbara to San Diego, and has a very strong disagreeable smell.